Missouri is the place that brings the thrill of the grill to London. This is a contemporary style city restaurant. The decor has a modern, sophisticated feel with its wooden floor, white pastel walls and modern paintings. The casual, comfortable surroundings and well-spaced seating provides a discreet setting to enjoy lunch or dinner. This is one of the few places where you can enjoy a beautiful, tender, perfectly cooked steak. All it's beef is aged for 28 days and comes from the Buccleuch estates in Scotland. There is also a good selection of fine wines and some hard to find specialities such as Maryland Crab Cake, Clam Chowder, Mahi Mahi and Missouri rub breast of duck. Be sure to receive a warm welcome from the friendly staff who are very knowledgeable and will confidently recommended a wide range of favourites without sounding patronizing. Missouri value their future customers too and any little one's will be offered their own menu and a high-chair. This restaurant is truly Aldgate's hidden gem! The menu expresses a variety of American classics and the food is absolutely delicious. Why not try the Maryland Crab cake with its all round excellent flavours you won't be disappointed or the mouth watering fillet steak with asparagus and horseradish sauce. A must try for all steak lovers. Missouri will soon become your favourite neighbourhood restaurant. The wine list, offers a good selection of both European and New World wines and there are loads by the glass and down at the affordable end. Missouri likes parties! This is the perfect spot if your looking for a venue with a popular American menu. The private room can accommodate 14 people and is ideal for business meetings, family celebrations and social gatherings. 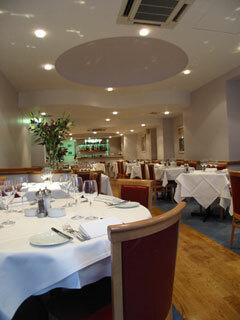 There is no extra charge or room hire for the use of the private room. A variety of American classics that span the country � from Zinfandel Wines to Virginia Ham and New York Cheese Cake. The cooking is good, the steaks are great, the service is friendly, the prices are reasonable.